The building at 107 – 143 Muswell Hill Road, in North London, was Grade II listed, comprising a retail parade of six shops with 10 residential units above, attached to a listed Odeon cinema. The cinema, parade and flats were constructed circa 1936 and modified internally and externally over the years. Nevertheless, the buildings appeared to have been in decline for some time. The project consisted of creating a new retail facility, plus adding eight new flats. It was essential to safeguard the historic fabric, architectural character and overall appearance of these listed buildings, without neglecting the importance of creating the additional retail floor space, a cafe and the provision of residential units on the third floor. 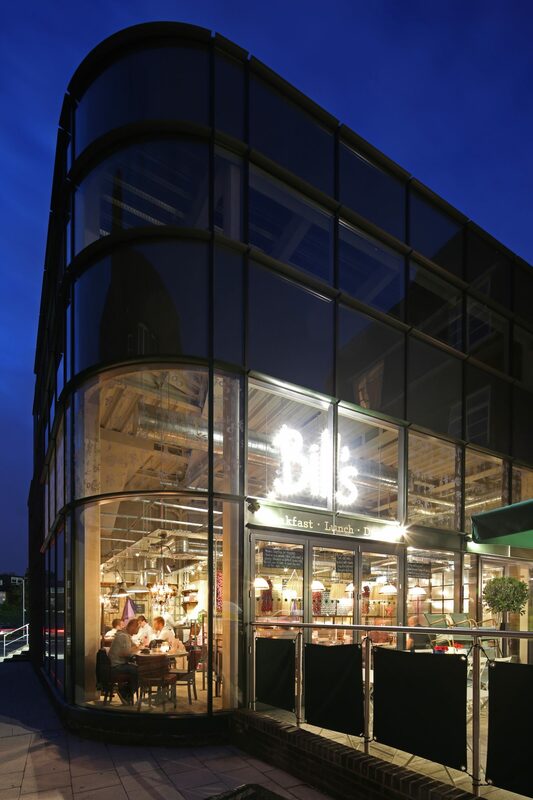 A major element of this refurbishment project was the installation of a SWC+ aluminium curtain wall system, including a curved corner for the new restaurant, and the fitting of Hybrid composite casement windows in residential units. Soundcraft was awarded the £150,000 contract to carry out these works. The major challenge was in the curtain walling, particularly the curved element, whilst adhering to a tight programme on a restricted site. Initially, dimensions of the curved elements were taken from the architect’s drawings. These provided the basis for a MDF template to be produced by CNC in Soundcraft’s factory. This was taken to site and in liaison with the contractor’s engineer a final template was agreed, which formed the basis for the procurement of the double glazed units, and the fabrication of the structural members. The SCW+ profiles, produced by Soundcraft’s system supplier, Senior Architectural Systems, were sent to a specialist aluminium ‘bending’ contractor, and formed into the exact curves or arcs required. 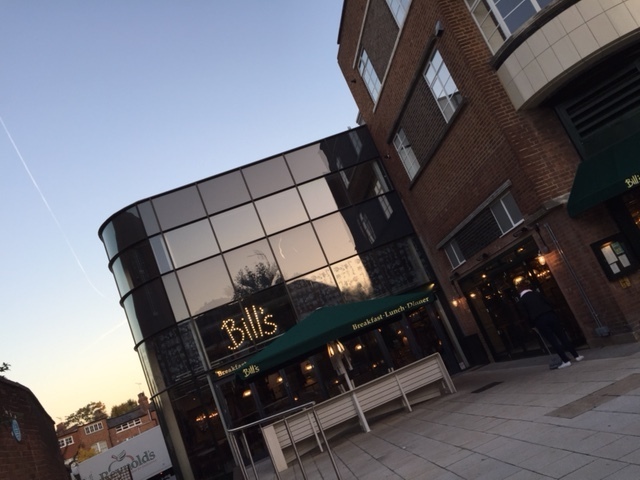 The curved curtain wall section was installed last, after the ‘normal’ flat elements had been fitted in place. Specialist equipment was brought in to lift the glass into place. The curtain wall included two sets of SD sliding folding Vistafold doors. In addition to the curtain walling, Soundcraft manufactured and installed Hybrid Series 1 casement windows and doors; shop fronts and side screens; and two sets of SD double doors. 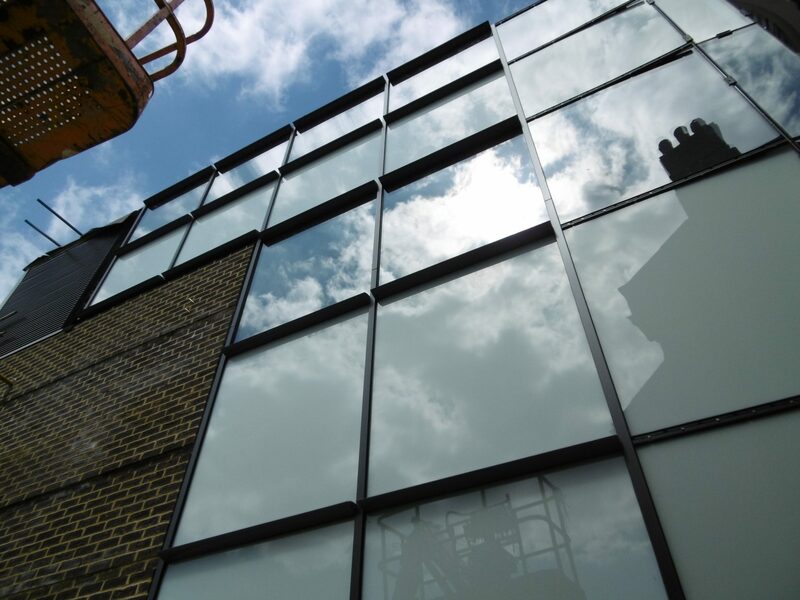 SCW+ curtain walling is a cost-effective, semi-unitised, zone-drained, pressure equalised aluminium system with slim 50mm sightlines. It is CWCT certified. 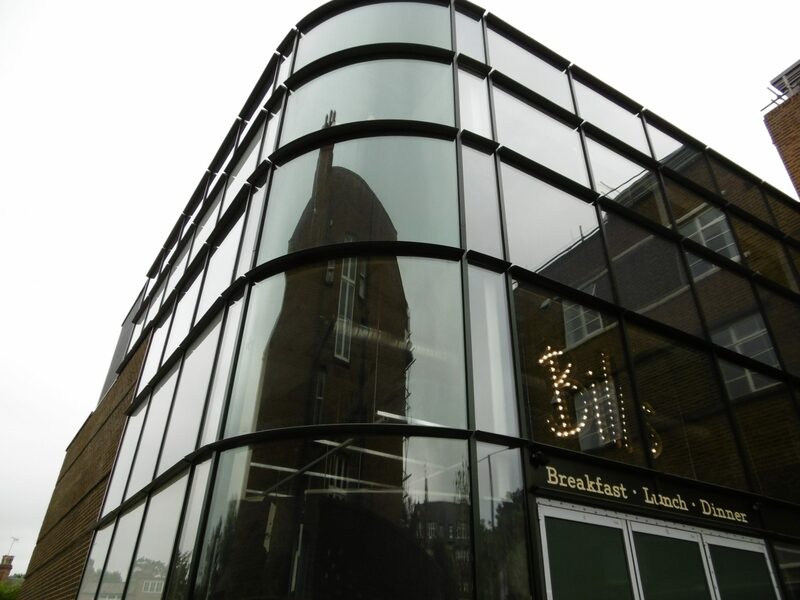 The double glazing provided a contrast between the clear glass on the café and the dark grey glass on spandrel panels and glazing above. Hybrid Series 1 composite casement windows were fitted to the residential apartments. Hybrid windows are a combination of powder coated aluminium (outside) and timber inside. They can provide good thermal and acoustic performance. Hybrid windows offer a 25 year guarantee on the external aluminium, with PEFC sustainable timber internally. In addition, Hybrid windows have been tested to PAS 24 and BS6375. Hybrid Series 1 composite doors generally have the same performance characteristics as Hybrid windows. SD sliding & folding doors, and SD double doors including radiused anti-finger trap stiles and Part M compliant thresholds.